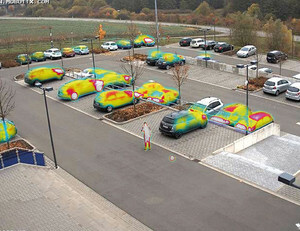 Thermal cameras from MOBOTIX have taken a huge technological leap by fusing the analytical components of their surveillance platform with their new Thermal Radiometry Sensors. 6 megapixel thermal sensors detect to 50 mK (50 thousandths of a degree) between -40° to +1022°F. Detects in complete darkness and/or through smoke, smog, or thing plastic film. Set temperature alert thresholds in up to 20 ‘windows’ within the cameras view. Combines with MxActivitySensor for best in class motion detection. No glare from strong sources of lights like headlights, flashlights, and lasers. Detection of hotter than average body parts or technical devices. Low camera power consumption of max 5.5 W.
Thermal image sensor is easily configured using camera software in web browser. iP connectivity allows for instant alerts and automated equipment shutdowns. All software and updates FREE FOR LIFE of camera. Only one MOBOTIX thermal camera is required to protect a huge outdoor area without the need of any additional illumination. The combination of thermal, video sensor and intelligent software based motion detection like MxActivitySensor are perfectly suited to cover wide perimeter ­situations efficiently without any secondary equipment like IR-conventional light or ­additional sensors even in complete darkness. Easily spot intruders in pitch dark conditions. Easily monitor from long distances at remote locations. Thermal camera sensitive enough to catch a smoker in a no-smoking zone. Continuously monitor equipment to prevent breakdowns, automatically. Catch small fires before they cause real problems, automatically. On top, MOBOTIX has launched a new series of thermal radiometry (TR) models to generate automatic alarms, defined by temperature limits or temperature ranges, which is vital to detect potential fire or heat sources. Up to 20 different temperature triggers can be easily defined within the new TR (Thermal Radiometry) window or the whole sensor image can be used with a typical accuracy of ±10 °C. MOBOTIX thermal dual camera systems offer also thermal overlay to localize the hot spot in the visual image and to prevent bigger damages. The standard Power-over-Ethernet (PoE) compatibility and the market leading low power consumption of only 6 watt allows operation of MOBOTIX thermal camera systems in every situation. Using a dual sensor camera, we meld the thermal image with standard video footage to show which objects in our field of view are surpassing our set threshold. MOBOTIX designs and manufactures all of their cameras and parts at their headquarters in Germany. Every single camera is put through strenuous temperature testing before being shipped. MOBOTIX security cameras and thermal cameras last 9 years on average due to their ‘no moving parts’ platform. Less movement means less breakdowns. For a thermal camera solution that lasts at an affordable price compared to the other guys, call ROi Technology Solutions at 972-498-1352. Our Mobotix Thermal Security Camera Service Area includes all of Texas but we are based out of Addison in the Dallas Forth Worth metroplex with nearby cities such as Arlington, Plano, McKinney, Lewisville, Irving, Frisco, Flower Mound, Denton, Allen and as far as El Paso and Laredo.